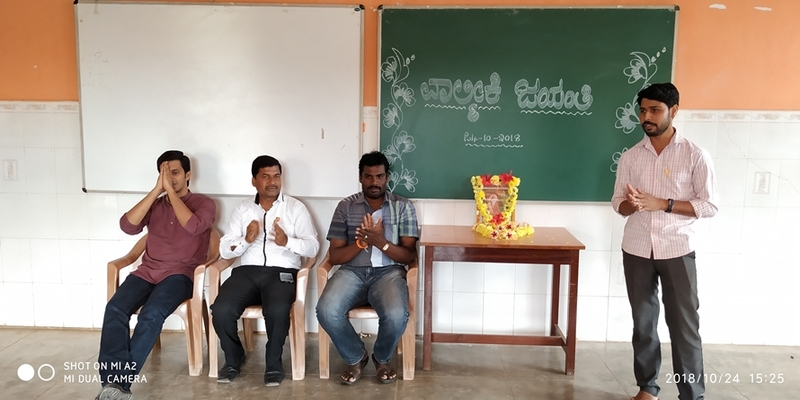 DBCLM under the project of Open Shelter organized a short programme to celebrate Valmiki Jayanthi on October 24, 2018. Fr Jose Joseph, Administrator of the centre, was the chief guest of the program. Mr. Shrinivas, CS Project Social Activist and Mr. Dinesh KN, Open Shelter Social Worker, were also present on the stage during the program. Ms Shruthi, a teacher in the RBC narrated the life of Valmiki briefly. Valmiki is considered as the first poet (adikavi) and Ramayana is the first poem. Valmiki was born as Agni Sharma to a Brahmin named Pracheta (also known as Sumali) of Bhrigu gotra. According to legend he once met the great sage Narada and had a discourse with him on his duties. Moved by Narada's words, Agni Sharma began to perform penance and chanted the word "Mara" which meant "kill". As he performed his penance for several years, the word became "Rama", the name of Lord Vishnu. Huge anthills formed around Agni Sharma and this earned him the name of Valmiki. Agni Sharma, rechristened as Valmiki, learnt the scriptures from Narada and became the foremost of ascetics, revered by everyone. The floral tribute and different cultural programmes by children made the programme more colourful.